BlackRock talks the talk, but doesn't walk the walk on global warming. The world's largest investment company issued a bold call to arms in Aug. 2016 with its "Adapting Portfolios to Climate Change" report. "Investors can no longer ignore climate change. Some may question the science behind it, but all are faced with a swelling tide of climate-related regulations and technological disruption. 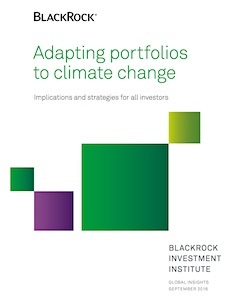 "Drawing on the insights of BlackRock’s investment professionals, we detail how investors can mitigate climate risks, exploit opportunities or have a positive impact. Climate-aware investing is possible without compromising on traditional goals of maximizing investment returns, we conclude. "We then reflect on steps that stakeholders in the climate debate are considering, including the use of carbon pricing as a cost- effective way to reduce emissions. "Our overall conclusion: we believe all investors should incorporate climate change awareness into their investment processes." Let's jump forward to an Oct. 15 report in the Financial Times panning BlackRock's record on warming. According to Proxy Insight, BlackRock repeatedly voted against climate change resolutions offered by shareholders at annual meetings. It voted "no" on resolutions at 14 companies, while backing a mere two—Occidental Petroleum and at the high-profile post-Rex Tillerson Exxon meeting. To the FT, BlackRock's voting record makes no little sense. "If a fund house believes climate change could hurt stocks over the longer term, it seems sensible that investors should demand as much information as possible on these risks at all companies." Those companies with questionable voting records often offer up the excuse that they are diligently working behind the scenes to influence management to do the right thing. BlackRock went that route as a spokesperson told the FT that "it takes climate change seriously and engages with relevant companies." That excuse is a cop out. Though Donald Trump may pull the US from the Paris climate treaty to please his base, the rest of the world is moving on climate change. Warming is a reality, a problem that will trigger more shareholder resolutions. The FT put it well: "It is now up to the world's biggest investors to put their vote with their mouth is. A couple of high-profile protest votes that generate nice headlines are not enough." Neither are empty reports on the impacts of global warming. They are hogwash, or perhaps greenwash is a better term to describe companies that use lofty words to shield their support for global warming-denying polices in the fossil fuels sector.